1.) 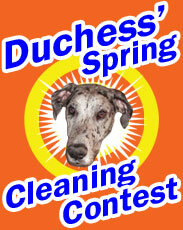 Take a picture of your doggie getting cleaned up (or you may already have one). They can be in the bathtub, outside, in a wading pool, the groomer’s… wherever! 2.) E-mail ONE picture to me at lifewithduchess at hotmail.com by APRIL 26th (I extended the deadline a week since a lot of people are saying that they may not make the deadline) (put the @ symbol in there… keeping it out of this entry for spam reasons). That gives you plenty of weekends and plenty of opportunities to get dirty doggies. 3.) In the e-mail include your dog’s name, your human’s name, your blog address, and please do not photoshop or alter your pictures. 4.) The three members of the executive council (me, the Vampire Wife, and The Boy) will choose our favorite photo each, then Duchess will choose the winner (yes you read that right). 5.) The winner will receive either a $20 donation made in their name to a rescue or shelter of their choice, or a $20 gift card to Drs. Foster & Smith – whichever they choose. 6.) Place this button on your blog in the sidebar to let everyone know you’re competing! Here is the code for the graphic that you can just cut and paste into your blog. That’s it! Looking forward to receiving all of your entries… now get to e-mailing!